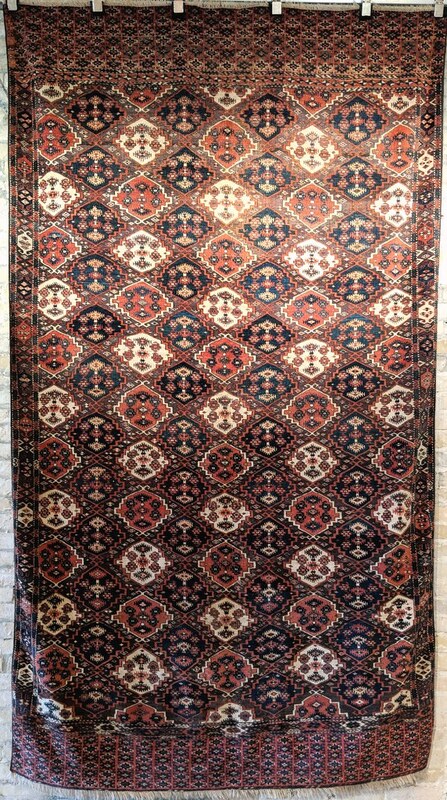 A while back I had the opportunity to acquire this Chodor rug. It's my first Chodor rug, so I have a lot of learning ahead of me. I've gone through Kurt Munkacsi's excellent article "Dividing the Chodor", but as does any good article, I was left with more questions than answers. First, the details. The size is about 9x5. The design is a familiar array of Ertman guls on a brown/purple background. The border system is simple, with hexagonal hooked devices on the sides, and a mix of diamonds (top) and a familiar kochanak type of border along the bottom. The elems have a repeat of small stepped medallions with "hooks" (someone please remind me what the term for that design element is, please). The Ertman guls have an array of blue shades (from dark / navy, to a relatively light teal blue), white, and a clear red that borders on "salmon". There is a good green in small doses, along with shades of yellow and orange, and some dark purple. 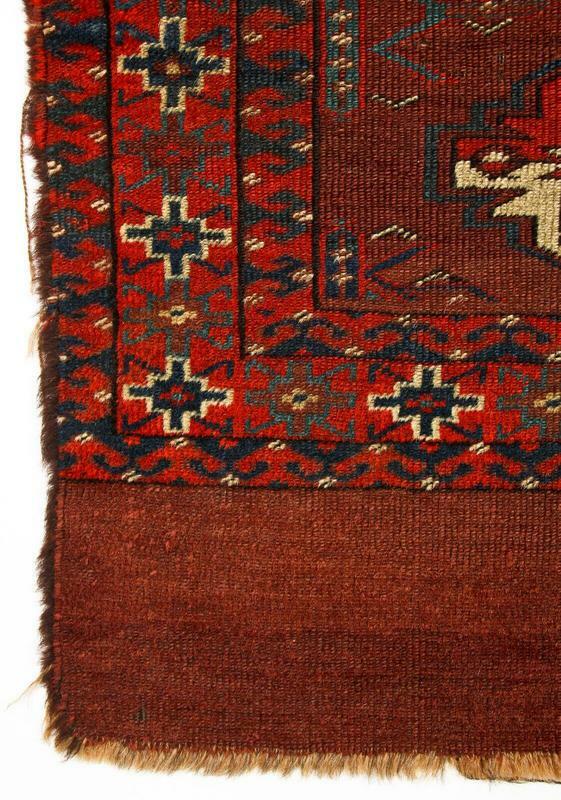 I would note that unlike most Ertman gul rugs, there is no lattice between the guls on this rug, but instead an array of small diamonds of various sizes. With my naive eye, there aren't any dyes that look obviously chemical. The rug has wool warps (light beige), and two shoots of light-brown wool. There is minimal depression of alternate warps. Knotting is asymmetric, open to the right. I find the rug quite attractive, but doubt it has much age. My guess is perhaps late 19th century or a bit later, based on the lack of a lattice and the somewhat simple elem design. I'd welcome comments and information (and of course analogies) from those with more experience with Chodor weavings. 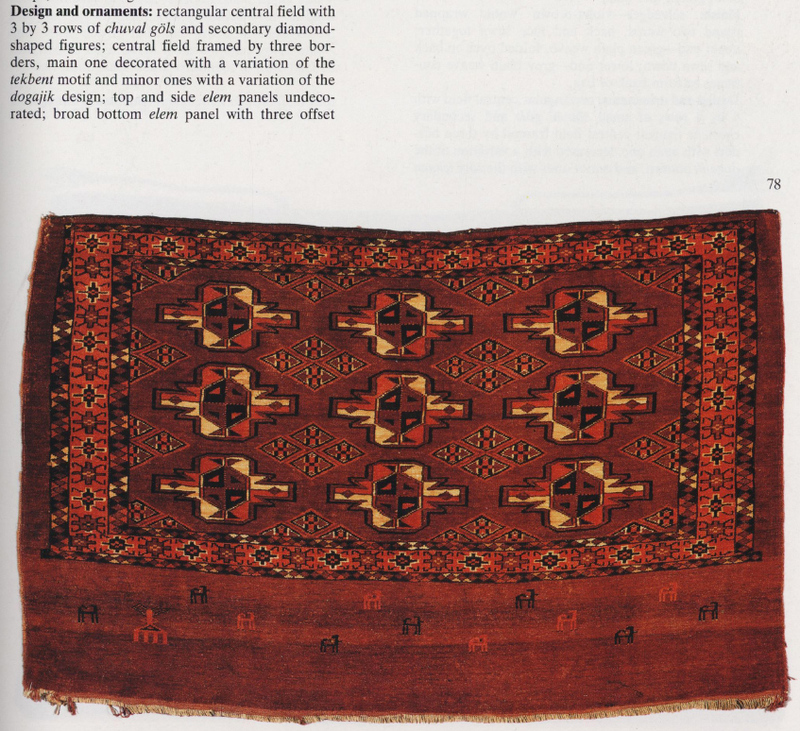 Have you seen Mackie & Thompson's Turkmen, published by the Textile Museum (1980)? They provide an accurate brief description of what are essentially two 'strains' of Chaudor rugs, viz., the somewhat degraded version from the late 19th century, and the better, older rugs. They cover that aspect of the matter on one page, which I would be happy to reproduce and post if you need it. I happen to have one of the later group (and like it, notwithstanding the doubtful reviews by the critics ). 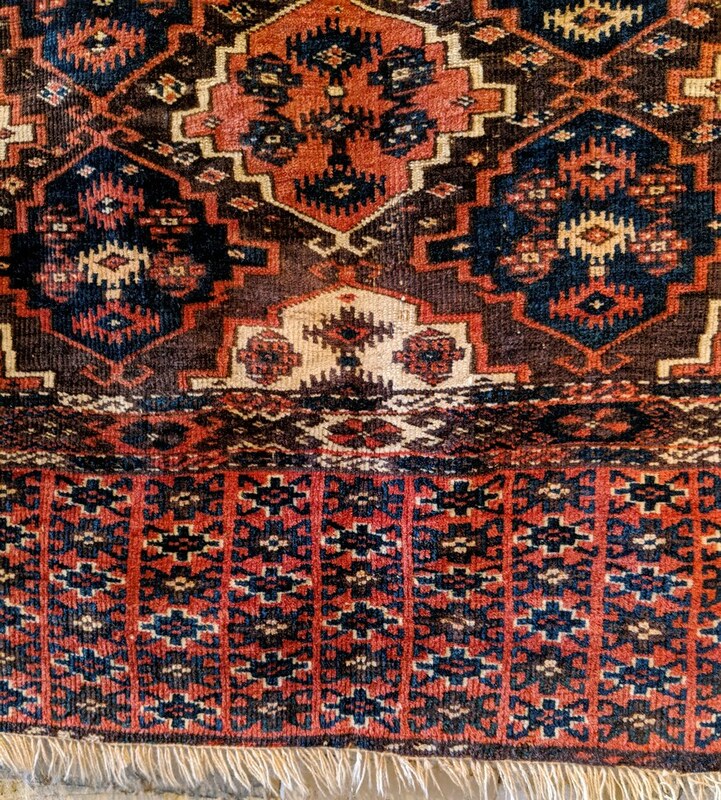 I don't have much of a decent picture of the whole rug, but I have a few detail images that show some of the diagnostic characteristics of the type (such as 'part cotton' wefts) pretty well. Are you interested? I haven't seen the Mackie and Thompson book, and would be delighted to see some information from it, if you don't mind. Would also be very interested to see your rug. OK. Must scan the page, and will post in the early evening, GMT minus five (thereabouts... ). I only have one Chodor piece, a late chuval (below). Structure and materials look very similar to yours (images below). I think you are probably correct about the age. 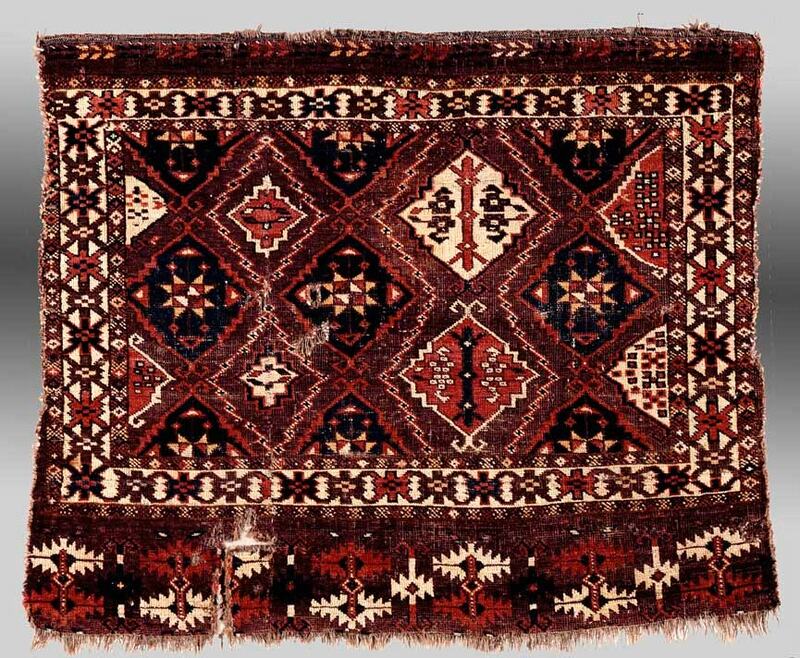 The guls on your rug are sometimes considered earlier, as Elena Tasareva mentions in her book on the Kingston collection. But, the densely ornamented elems and the close spacing of the guls on yours vary significantly from older pieces with clear space between the guls and the "netting" around them. My chuval is turn-of-the-century, I think, and has a hot red. Yours seems to have a somewhat more subdued red, but it still looks like a synthetic to me. It's a handsome rugs, congratulations. The elems have a repeat of small stepped medallions with "hooks" (someone please remind me what the term for that design element is, please). Last edited by Joel Greifinger; June 5th, 2018 at 01:36 AM. Steve was concerned about possible copyright issues if we post a page directly from the Mackie & Thompson Turkmen book, so I will summarize their comments regarding Chaudor rugs. Many of them have survived. There were two distinct types before 1880 (when synthetic dyes were introduced). The later group featured the familiar field design and layout with a distinct color scheme consisting of a light purple or violet brown field with a secondary palette of light red, green-blue, two blues and yellow. A minor portion featured the light red in the field, in which case, the violet brown appeared as a secondary color in the ornaments. 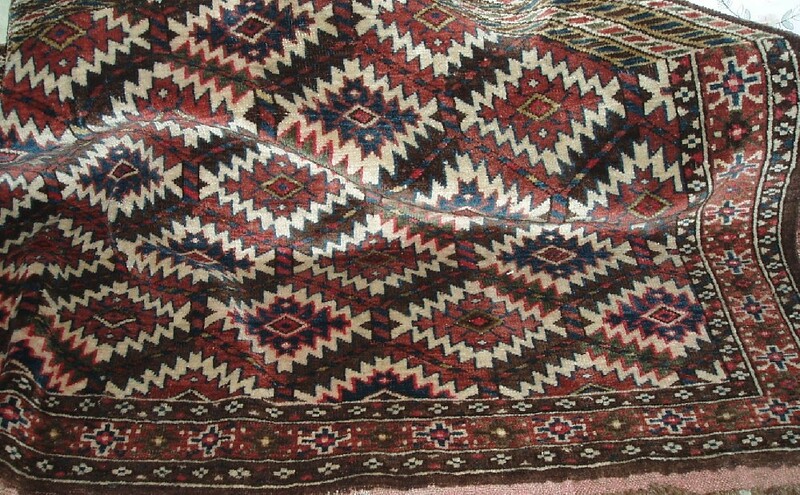 All pieces use the Persian knot open right, and most had a cotton weft, or ‘partial cotton,’ meaning that the wefts were two strands, sometimes all cotton, sometimes cotton and (brown) wool, and sometimes all wool. 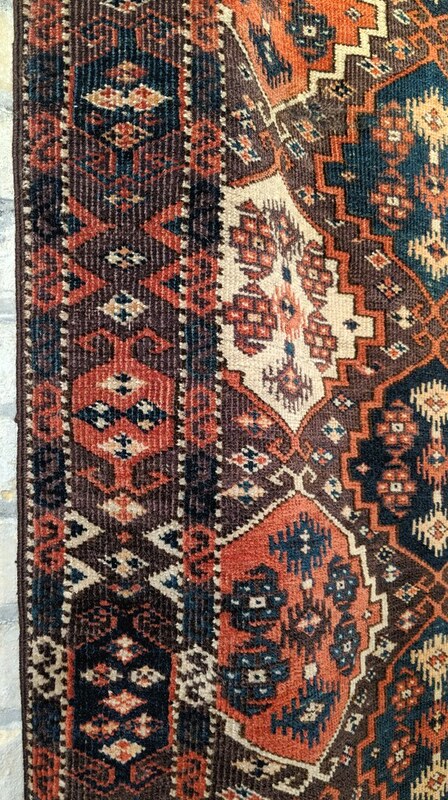 In such rugs, the three weft combinations would occur at random. Two shots of weft were the rule. Four cords of goat hair selvages. The earlier type of Chaudor featured a slightly different palette of deeper purple-brown and red, with light celadon blue-green. 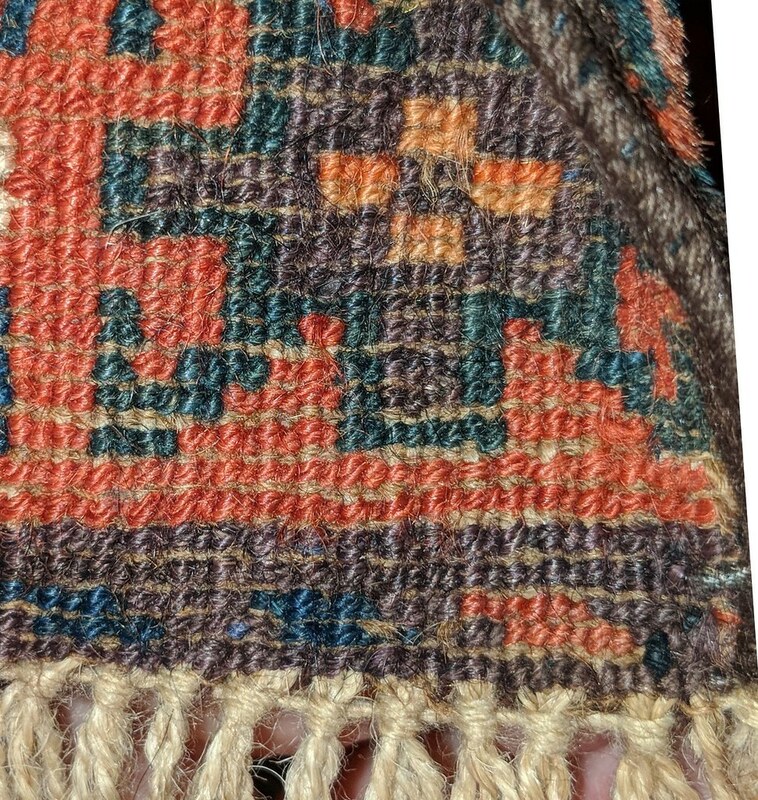 An even older group featured even deeper colors including apricot and better wool. This last group is called proto-Chaudor. My rug is a standard example of the later group, with the light purple field, etc. Here are a few images. Backs. The slightly haphazard look of the backs on the later 19th century Chaudors is not as well shown in this image as in the closer one two below. Unfortunately, I have no examples of the more refined early ones. As regards your rug, I am no expert, but I think you may be giving it short shrift simply because it does not have the typical layout. Those colors look boffo to me, and I do not see the deterioration of Chaudor work (such as it was) having gone in that particular direction. Thanks for the response and perspectives, and for sharing that example. I share your view that the layout of the design seems to place it later in the continuum, as you've pointed out. However, I think the colour might be good. If you look at the close-up picture of the back you can get a better sense of the colour. I'll never claim to be able to detect a synthetic red with real confidence, but this one didn't scream "synthetic" to me. I like your chuval - it's a "lively" piece. Thanks for sharing the information, and for showing the example. The knotting technique on yours is similar to mine, on superficial perusal. The main differences seem to be the use of cotton in the weft on your piece, and a different selvage structure. Yours appears to have a nice purple, and I like the border design. Does yours have blue guls? I'm still trying to place the name for the design element. I generally associate it with Yomud weavings. I have a Yomud asmalyk that I bought many moons ago that has that design in the border, with "painted" ends to the "hooks" (see below). It's interesting to note that Munkacsi has quite a bit discussion about the interactions between Chodor and Yomud tribes at various time points, resulting in some crossover of designs onto Chodor weavings. Perhaps this is an example of that. Does yours have blue guls? No, unfortunately not. Mine is decidedly lower end. Just the salmon and ecru guls. Here is the best I can produce in terms of an overview. BTW, the dog is mine, but not the legs. I must say it has a rather regal presence in the setting. The dog certainly seems to approve! In that picture, we were getting ready to host the wedding of friends in the back yard. The table was to be the bar. The groom's elderly mother, whom I had not previously met, came around the corner and immediately exclaimed, "This is a nice rug!" It may be the first and only time a civilian ever said anything encouraging about any of my rugs spontaneously and without prompting. That wonderful lady immediately became one of my favorite people! BTW, if she had any ideas about Chaudor weft practices, she kept them to herself. Munkacsi has quite a bit discussion about the interactions between Chodor and Yomud tribes at various time points, resulting in some crossover of designs onto Chodor weavings. As one illustration, he shows this Chodor chuval with what he describes as "an old Yomut main border design." Does he opine on the age of that chuval? Plate 12. Chodor Group II chuval, lower Amu Darya region (? ), ca. 1760 (?). 1.02 x 0.84 (3' 4" x 2' 9"). 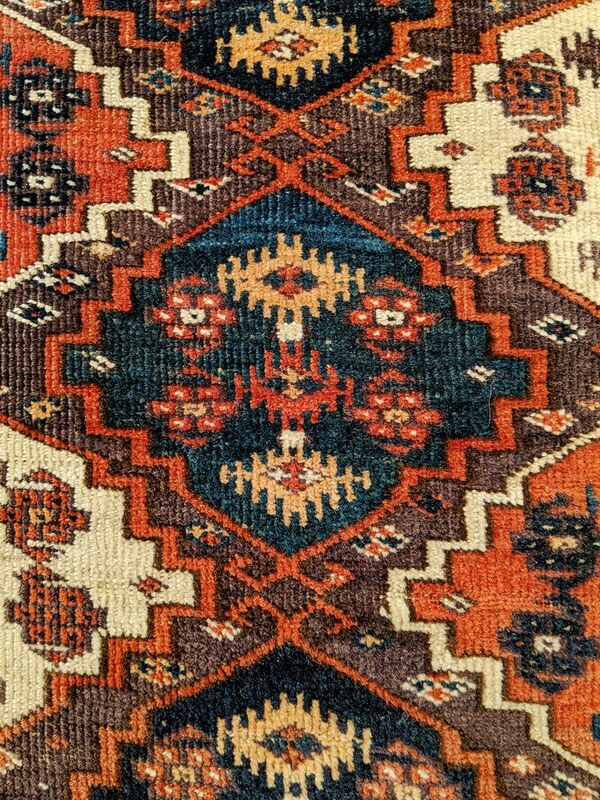 The oldest of the ‘blue güls with stars’ group, with an early zig-zag lattice and an old Yomut main border design. Munkacsi seemed to place a lot of emphasis on the lattice design in assigning dates. I'm still trying to place the name for the design element. Elena Tsareva refers to it as a variant of tekbent.